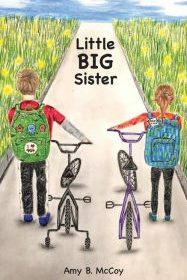 Amy B. McCoy’s new middle-grade novel explores a young girl’s relationship with her brother who has autism and her efforts to make her peers more understanding of those with special needs. Michael is two years older than Katie, his 9-year-old sister. But Michael’s autism often leads him to act much younger: watching “little-kid TV shows,” using a bicycle with training wheels, having frequent meltdowns. Michael’s needs limit both Katie’s alone time with their parents and the family’s ability to go on regular outings, and this often upsets Katie. But she loves her brother, and it bothers her when others treat him rudely or condescendingly. When Adam joins Katie’s class at school, she immediately recognizes that he, too, is autistic. At recess, Katie sees several classmates mocking Adam and decides to take action. With Lauren, whose older brother has cerebral palsy, and Bella, who has difficulty walking, Katie prepares a presentation for her class. The girls explain how cruel it is to mock and talk down to those with special needs, and discuss how someone with a particular disability can have many other talents. At the presentation’s end, Katie has not only changed some minds but has gained self-confidence. It’s difficult to write a children’s book that teaches a lesson while remaining engaging and avoiding didacticism. Through first-person narration (from Katie’s point-of-view), McCoy rises to the challenge. Katie is a relatable character: She is good-hearted and insightful, but also gets frustrated and anxious. The lists included at the end of each chapter, designed to look like pieces of notebook paper, should also prove entertaining for young readers. They include Katie’s inventories of her friends’ characteristics, her frustrations, her fears and the things she likes about herself. Little Big Sister is a gentle, winning story. It is especially well-suited to classroom use.